QComp was recently honored by ABB Inc. as its co-winner of the ABB 2016 North American Robotics Value Provider Award for Outstanding Performance. 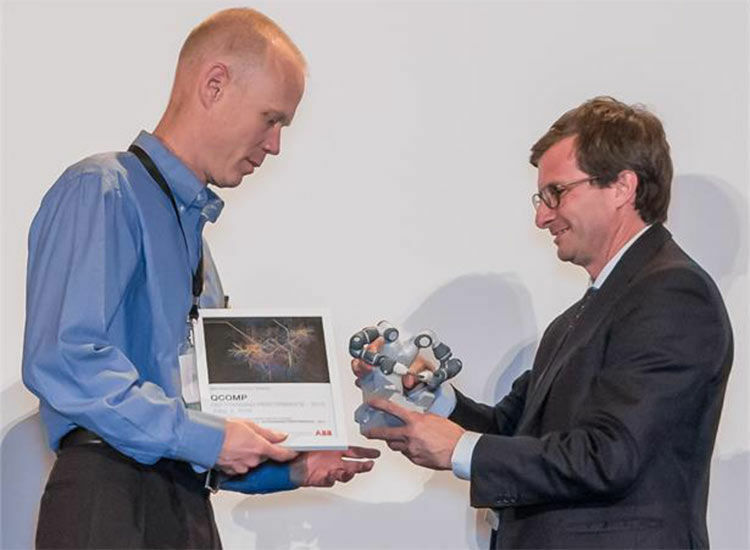 The awards were presented during ABB’s annual Robotics Value Provider Conference recently in Atlanta, GA. The award recognized QComp for its demonstrated outstanding performance in automation integration. Mr. Greg Whitney, vice president of engineering and manufacturing for QComp Technologies, accepted the award on behalf of the company. The awards were presented by Gustavo Sepulveda, ABB’s USA robotics general manager. QComp has been working with ABB Robots for over 19 years to provide manufacturers with the best robotic solutions to solve their application needs. QComp is excited to be selected as a preferred integrator to provide ABB’s new YuMi dual-arm collaborative robots. The YuMi is the first truly collaborative robot. QComp is using this inherently safe, extremely accurate, and flexible automated solution for small parts assembly and has been one of a select few integrators trained to help end users integrate the robot into their small parts assembly applications. “The YuMi robot is the first truly collaborative dual-armed robot designed for a world in which humans and robots work together,“ said Tom Doyle, President of QComp Technologies.